Former home of architect, entrepreneur, and traveler Christian Thams, Bårdshaug Herregård began as a parsonage that was converted into a thoughtfully decorated personal residence. Today, guests can unwind in one of the 89 comfortable guestrooms, located in either the historic mansion, the former railway stations, or the main building. The historic mansion houses nine guestrooms, with one completely and the rest partially, adorned in an authentic décor and furnishings that reflect the intricate details of Christian Thams' passions and history. On the hotel grounds, there are two small former railway stations from the historical railway “Thamshavnbanen.” Each station contains three guestrooms. The main building offers 74 spacious, modern rooms, with amenities such as flat screen televisions with cable programming and complimentary WiFi. 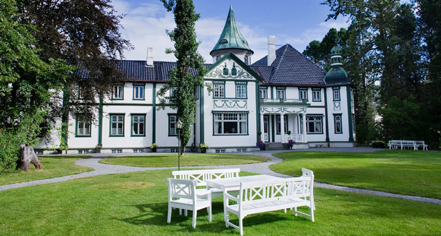 Rich in heritage and tradition, Bårdshaug Herregård offers meeting and event rooms equipped with modern technologies and delicious farm-to-table cuisine from the kitchen and bar. Situated at the mouth of the Orkla River, Bårdshaug Herregård is conveniently located to enjoy all of Norway's natural offerings. 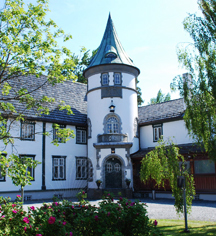 Bårdshaug Herregård, a charter member of Historic Hotels Worldwide since 2011, dates back to 1890. The estate was a popular guesthouse with noble visitors including Oscar II of Sweden, The Prince of Monaco, King Leopold of Belgium, and Norway's own King Olav V.
Parking: Self-parking: Available. Electronics cars and Tesla charging stations. Pet Policy: Service animals allowed: Please contact hotel. Pets allowed: Please contact hotel. Former home of architect, entrepreneur, and traveler Christian Thams, Bårdshaug Herregård began as a parsonage that was converted into a thoughtfully decorated personal residence. Today, guests can unwind in one of the 89 comfortable guestrooms, located in either the historic mansion, the former railway stations, or the main building. Learn more about the History of Bårdshaug Herregård .